This scenario is a ticket I received from a user of www.findlectures.com. People want ways to research the latest developments in their field, without search results being cluttered with talks that mention their interests in passing. “Vegan cooking” would be an appropriate result for this – as would be recipes for people with food allergies. The negative search for dairy implies a hierarchy of items we wish to remove: milk, cheese and any specific types, components, or brands of these (e.g. Parmesan, whey, Kraft, respectively). It’s unlikely that the searcher has thought this far into what they want, but implicitly expect it. This search implies a geography and time range. This article about the founding of Arden, Delaware, would be an appropriate match because it is nearby. This list is pretty good, but far too short – Wikipedia’s list of Christian sects includes nearly 200 entries just under “types of Baptist”2. The tree of concepts for politics has nearly nothing. Of the results it returns, none of these are what people mean by “no politics”. A political talk is determined by time – whatever is in the news now, where I’m at, is political today, and history tomorrow. Machine learning techniques are a compelling alternative to using a database maintained by a team, because you can rely on a computer to find patterns, and update your model as new text becomes available. Word embeddings3 are a compelling tool, Word2vec can discover implicit relationships, such as gender or country capitals. Varations of Word2vec represent word meanings from how they are used in context, using mathematical vectors. Much of the practical research I’ve found on Word2Vec and search uses it to generate synonyms. There are a few papers suggesting that Word2Vec can discover other types of relationship4 (e.g. more general/specific terms). In a Word2vec model trained on English the “nearest” term to a noun is often the plural of the term, since those two terms are often used together. I expect this would be different in a language with cases (German, Greek, Latin), as related verbs and adjectives in change their endings to match. Concept search shines for users who enter multiple search terms. For “python” and “machine learning”, we really want to see pieces about scikit-learn, Tensorflow, and Keras. If we enter “java” and “machine learning”, we instead expect to see work by people using Stanford NLP or Deeplearning4j. This improves the quality of results, and it’s very fast. There is an excellent talk on this6 by Simon Hughes / Dice.com, who has a Solr plugin that implements the algorithm7. The Rocchio algorithm does a good job here, but I suspect that Word2Vec can do better because it maintains a concept of how similar two terms are. 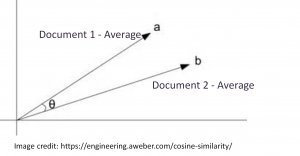 Understanding how Word2Vec defines similarity is foundational to the work we want to do with concepts: The distance between two term vectors is the cosine of the angle between them. This produces a score from 0 to 1. Like full text scores, higher is better, and it’s not mathematically valid to add the scores. 8 shows a promising example, using French language newspaper text to improve transcription of broadcasts. 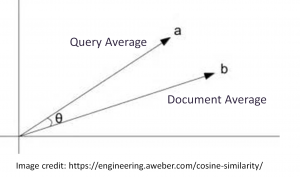 Let’s consider a simple change to the Rocchio algorithm: use synonyms suggested by Word2vec, but incorporate the distance from the source query to the synonym as a weighting factor. This code uses the angle between terms as a boost. The following text shows the resulting Solr query looks like, The caret(^) is a boost. These boosts are multiplied by the weights Solr maintains internally (BM25)9. This accounts for how often a term occurs – really common synonyms will have essentially no effect on the output. These results look really good – we’ve removed all the “code” oriented results. 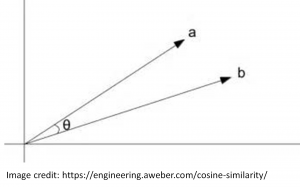 In my first implementation I used the cosine similarity as the boost, rather than the angle it represented. This is almost as good, but it returned an article titled: “Re-writing, Re-reading, Re-thinking – Web Design in Words”. Clearly this has the correct terms, but is not actually about the topic we’re looking for. 10. Per the linked paper from Microsoft Research, this is a good technique if it is used to re-shuffle top results (i.e., you would not want to replace full text search with this). This is not fast – computing all of these term vectors and averaging them took 5 minutes 45 seconds on my machine with 16 parallel threads. This could be significantly improved by pre-computing the averages for each document and running on a GPU. 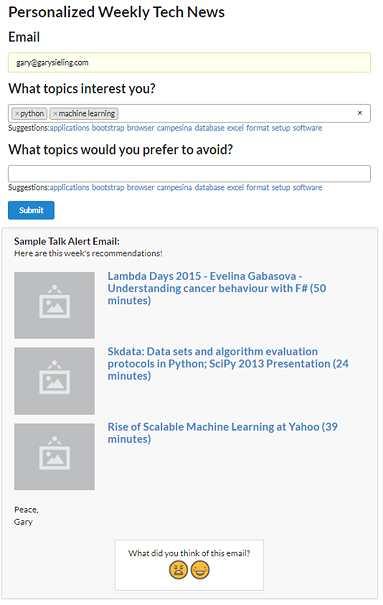 Some People who set up email alerts enter all of their interests (Art, Hiking), and some enter terms that modify each other (Python, Programming). We need to identify whether each term is related so that we can choose between “AND” and “OR” in the queries we generate. A simple approach to this is to compute the distance between each query term and segment them into clusters. While we’re now getting good results we often see articles on the same subject. 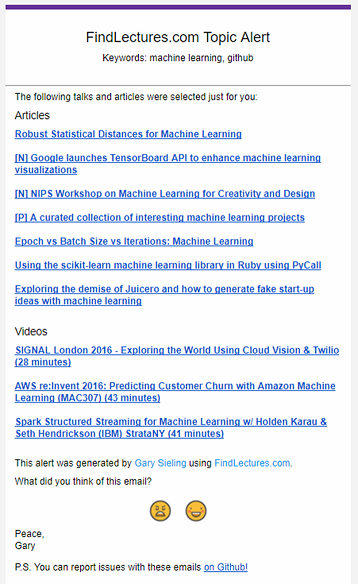 For an email list dedicated to learning, it’s no use giving people the same article written multiple times. Improving the diversity of search results is a fascinating problem. If this was an e-commerce site, producing varied results for a broad search like “shoes” gives the users hints about what a site has to offer, as well as prompts to refine the search. Solr can do k-means clustering of documents around phrases it discovers11 using Carrot212 – we could improve diversity by choosing a talk from each cluster. This approach is really fast, but difficult to combine with the prior techniques (pick N results, reshuffle). A Word2vec alternative could do this: Pick the top result, then find least related result. Average these two, then find the next most unrelated talk. Again this was a bit slow – 1 min, 30 seconds @ 16 parallel threads. To prove this works I changed the query to “python and pandas” to make it harder – that guarantees the original three articles show up. In general, each technique builds upon the last by obtaining the top results and re-shuffling. Adding more computing resources improves more relevance, but it takes some time to build and retrain Word2vec. In the next iteration of this, I’m intending to explore generating sequences of talks that build on each other, as well as dealing with geography (“history of philadelphia”).